As most small business owners know, obtaining a loan can be a logistical nightmare. Even for highly qualified businesses, with a strong daily cash flow, good credit and a healthy annual revenue, the process can be painstaking. Banks typically require reams of paperwork and documentation, and can take a significant amount of time to approve a loan — even for businesses who should easily qualify for a commercial loan. 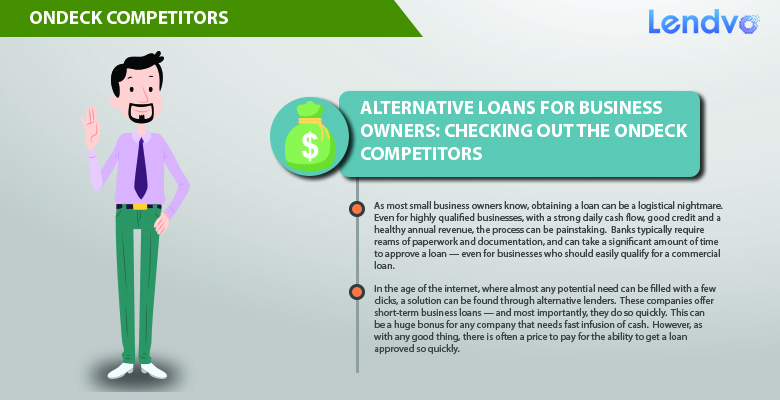 In the age of the internet, where almost any potential need can be filled with a few clicks, a solution can be found through alternative lenders. These companies offer short-term business loans — and most importantly, they do so quickly. This can be a huge bonus for any company that needs fast infusion of cash. However, as with any good thing, there is often a price to pay for the ability to get a loan approved so quickly. The commercial alternative lending industry is largely unregulated business, which means that interest rates can be sky high. These private commercial lenders are not subject to traditional banking regulations, and so are often free to set sky-high interest rates. In some states, there is no commercial usury limit, and so these lenders can set incredibly high interest rates. Between fees and interest rates, the annual percent rate on a short term loan can easily exceed fifty percent. With aggressive terms that strongly favor the lender, these loans are not for all business owners. They can be an important tool for a business owner that is in a financial crunch, but only if the company is able to meet the terms of the loan and make the often steep daily repayments. Alternative lenders, since as OnDeck, CAN Capital, IOU Central and Kabbage are able to process loans so quickly by taking advantage of new technologies to analyze the creditworthiness of small businesses who apply for loans. Applications are processed online, with a minimal amount of paperwork to submit. Typically, there is no hard credit check, so applying for a loan through an alternative commercial lender will not impact a small business owner’s credit score. They utilize algorithms to evaluate real-time cash flow, credit scores, spreadsheet projections — and even online customer reviews. Companies such as OnDeck evaluate more than 2,000 data points as part of its evaluation process, and can approve a loan in minutes through its process. For most alternative lenders, approval is issued on the same day that a business applies for a loan. While loan terms vary by lender, the average term for small business alternative loans is nine months. OnDeck provides loans in terms ranging from three to thirty-six months, while Kabbage offers loans for terms of up to twelve months. For most loans, repayments have to be made daily, although some lenders offer repayments on a weekly or monthly basis. OnDeck, one of the oldest alternative lending field, has loaned more than $1 billion since 2007, while CAN Capital loaned $1 billion in 2014 alone. With a growing number of lenders operating in the commercial alternative lending sector, competition has driven down interest rates — but when fees are added in, the interest rates can still be more than 50 percent on a compounded annualized basis. Although OnDeck is well-established in the business, there are a number of competitors that have sprung up in recent years that are offering similar interest rates and terms. For example, on a $50,000, six month loan for a well-qualified restaurant owner with a daily cash flow of $5,000 and $1.5 million in annual revenue, two other lenders — CAN Capital and IOU Central — were able to provide competitive hypothetical loans. OnDeck offered a loan with an 11% simple interest rate, with a daily payment of $440 for 126 days, and a $1,250 origination fee (total payment: $56,690). IOU Central’s loan had a 13% simple interest rate, a daily payment of $433.17 for 126 days, and a $2,475 origination fee, plus a $23.21 daily loan guaranty fee (total payment: $59,979). CAN Capital offered a loan with a simple interest rate of 15%, with a daily payment of $435.61 for 132 days, and no additional fees (total payment: $57,501). Based on these examples, OnDeck offered the best overall deal — but it is easy to see how interest rates and fees can quickly add to the overall cost of a loan (such as the daily loan guarantee fee for the IOU Central loan, which added nearly $3,000 to the total cost of the loan). Each alternative lender has different requirements in order to be approved. For example, OnDeck requires business owners to have a credit score of at least 500, a minimum of $100,000 in annual revenue and at least 12 months (one year) of operating history in order to be considered for a loan. Other lenders may require a higher credit score of 600 or greater, and up to two years of operating history of operating history in order to be approved. For very small lenders, Kabbage may be a better alternative, as they offer loans to businesses with annual revenue as low as $50,000. Lenders also vary significantly in the amount of loans that they will approve. OnDeck approves loans of up to $500,000, and may approve a loan for up to fifteen percent of a business’s annual revenues. Alternative lenders may approve loans for as little as $2,000 to as much as $5,000,000. The funds from these loans can be used for a wide variety of business expenses, from purchasing inventory, to leasing or purchasing equipment to expanding a business, financing purchase orders, or even as a cash advance. On average, alternative lenders loan amount range from $50,000 to $80,000. While OnDeck is one of the oldest and most well-known alternative lenders for commercial loans on the market, there are many options for small businesses seeking to obtain a fast loan with minimal paperwork. From IOU Central to CAN Capital to Kabbage, there is a lender available to suit most small business owners’ needs. The key with alternative loans — as with all loans — is to thoroughly examine the terms and conditions of a loan before signing one, paying close attention to details such as the interest, fees and penalties. Be sure that your company can afford the debt, particularly the minimum daily, weekly or monthly payments. Seeking advice from a professional, such as an accountant or an attorney, is optimal to ensure that you are making a good decision when it comes to alternative financing for your business. However, if you have done your homework and carefully examined the details of the loan, there is no reason to slog through the traditional commercial loan process with a bank. The alternative lending process can help you obtain financing quickly if you are in a credit crunch, and can help you take your business to the next level.